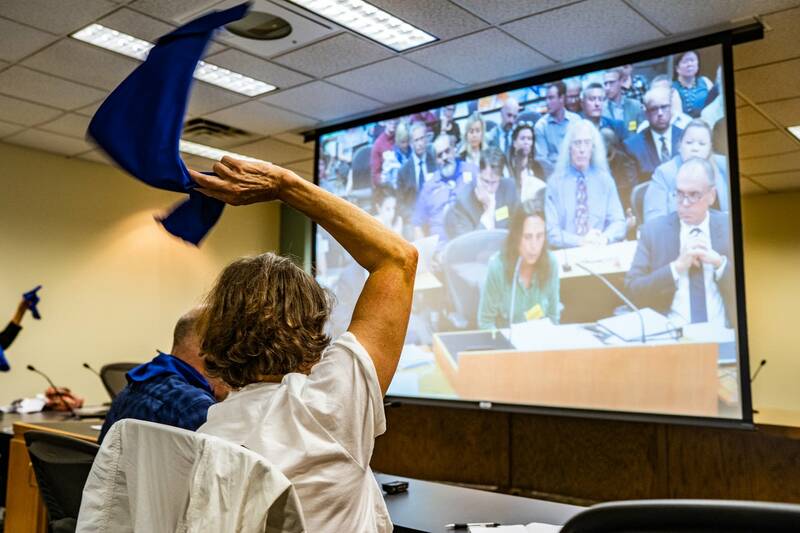 Updated: 7 p.m. | Posted: 2 a.m.
Enbridge Energy presented its final arguments to Minnesota regulators for a new Line 3 oil pipeline on Monday, arguing the project is needed to ensure safety and integrity. "Replacing Line 3 is the responsible thing to do. It improves the safety, the reliability, the adequacy and the efficiency of the crude oil infrastructure in the state of Minnesota," Christina Brusven, an attorney for Enbridge, told the five-member Public Utilities Commission as hundreds of supporters and opponents of the project listened patiently. The commission faces a decision next week that could reverberate across the country and the world, as companies invested in oil face off with environmentalists and Native American tribes who see oil pipelines as a threat to efforts to curb the burning of fossil fuels linked to climate change. The showdown, which has been years in the the making, started early Monday as bleary-eyed citizens waited in line for tickets into the hearings. They arrived on buses marked with "Minnesotans for Line 3" and "Stop Line 3" and wore T-shirts stating their views. Early in its testimony Monday, Enbridge addressed why it wants to build a new Line 3 along a new route. Not only would the new route avoid the Leech Lake and Fond Du Lac reservations, but it would also allow Enbridge to continue sending oil through the old Line 3 at reduced capacity while the new pipeline is being built. The administrative judge who reviewed the evidence recommended a new Line 3 be built in the the same trench as the old Line 3, but Brusven said that option would put Line 3 out of service for 16 months. Monday's hearing involved a morning of oral arguments, during which individuals representing designated groups that have been determined to have a stake in the decision had ten minutes each to speak. Once oral arguments were completed, commissioners began their questioning of the people who spoke. Questions are expected to continue into Tuesday. Representatives for Enbridge addressed the commission first, adding new commitments in an effort to get a Certificate of Need from the state. "You're going to see and hear probably a lot of emotion, and that's understandable," attorney Eric Swanson said. "Ultimately it's about the law and the record. ... We believe that leads to a straightforward answer." The Minnesota Department of Commerce reiterated its opposition to the proposed replacement project, saying the company has not met its burden of proof to show that a new Line 3 is needed. Deputy Commissioner Bill Grant said the main thing Enbridge failed to do in its application for a Certificate of Need is prove that there will be future demand for oil, and he said a report by the administrative law judge in the case showed that Minnesota refineries "appear to be getting as much oil as they can possibly refine," even with the old Line 3 running at reduced capacity. "Enbridge is asking a lot of the state of Minnesota," Grant said. "But they did not meet Minnesota standards." Grant said that even if Enbridge agrees to multiple conditions, such as those promised Monday, building a new pipeline would result in disproportionate impacts on Native American communities and would result in a 30-year cost to society of $287 billion — a calculation known as the social cost of carbon, which aims to estimate the effects of climate change from burning fossil fuels. Enbridge has argued that building the new Line 3 would result in fewer greenhouse gas emissions than not building it, because moving oil via truck or rail is more carbon intensive. Environmental and indigenous rights activist Winona LaDuke urged the Public Utilities Commission to deny Enbridge a Certificate of Need. "I would like to see the system work," she said, wearing a green shirt, and asking commissioners to take the "green path." "We want to be the state that does the right thing on climate change," she added. LaDuke, who is executive director of Honor the Earth, also hinted at the conflict that will result if the pipeline is approved. She and others recently purchased land near Park Rapids to protest, and other protest camps have popped up elsewhere in the state. "We want to stand in peace," she said. "We do not want unrest to unroll." Five Ojibwe bands in northern Minnesota are parties to the proceedings. 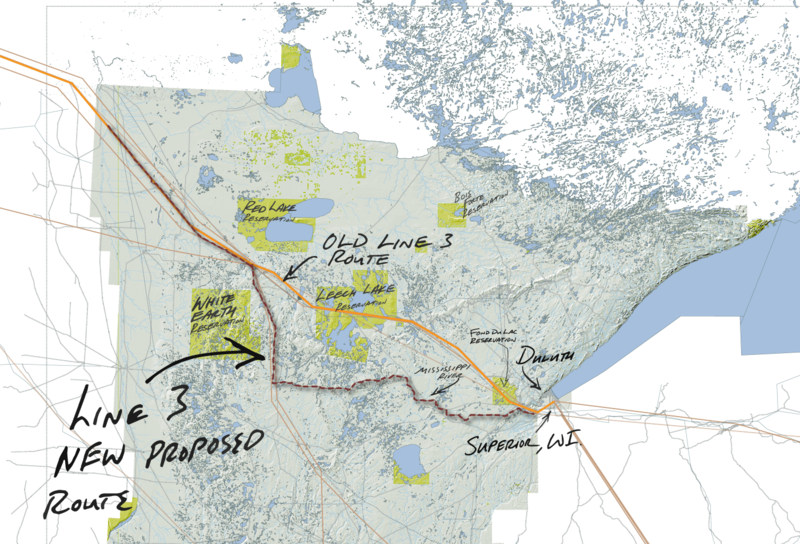 The White Earth, Red Lake, Mille Lacs and Fond du Lac bands strongly oppose the proposed Line 3 project. 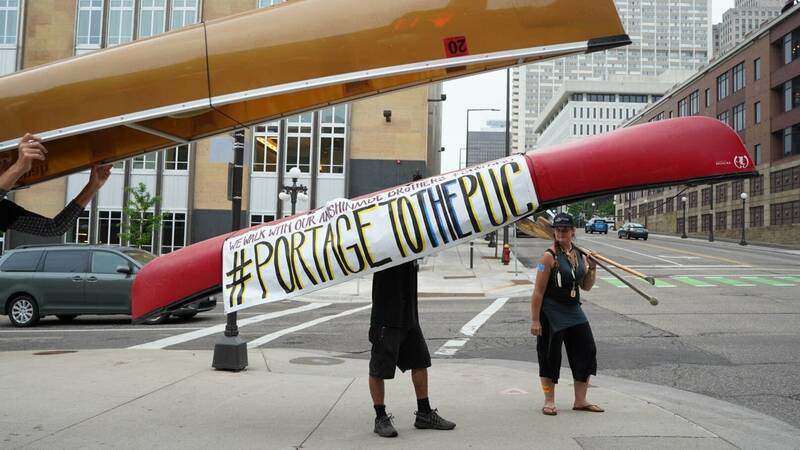 Enbridge's proposed new route for the pipeline avoids crossing any Indian reservations, but it does cross ceded territory which contains many important cultural resources and sites, and areas where tribal people hunt, fish and harvest wild rice. "It makes no sense from the Fond du Lac Band's perspective to solve a problem with a broken pipeline by putting a new one through an area that has never had a pipeline, said band attorney Seth Bichler. Enbridge's existing Line 3 currently crosses two reservations: the Fond du Lac Band's and the Leech Lake Band of Ojibwe's. The Leech Lake band has insisted for months that it will not allow Enbridge to build a new Line 3 across its reservation, a move a state administrative law judge recently recommended, saying it violates its sovereignty and the wishes of its members. But now, it has taken a different position than the other tribes and argued it would prefer to see Enbridge build a new line rather than continue to operate a degraded pipeline across its land, said Ben Benoit, the Leech Lake Band's environmental director. "The consequences of not granting the certificate of need, which means that existing Line 3 would continue to operate where it's at, with the intensive maintenance program necessary to keep it safe, has more negative consequences for Leech Lake than granting" a permit to Enbridge to build a new pipeline," Benoit said. The Line 3 pipeline case is unique in that early on, a judge allowed a group of 13 young people in their teens and 20s to intervene, meaning they can present arguments, cross-examine experts and also give final arguments alongside other groups. They're called the Youth Climate Intervenors. "Minnesota does not want nor need this pipeline," said Rose Whipple, a high school student of the Isanti Dakota and Ho-Chunk Nations and one of the 13 youth. And Brent Murcia, who will soon attend law school, said the cost of climate change exceeds anything Enbridge has offered in terms of benefits to Minnesota of building Line 3. "Wrapped up in that $287 billion [which is what has been calculated to be the social cost of carbon for Line 3] are stories about people like us," he said. 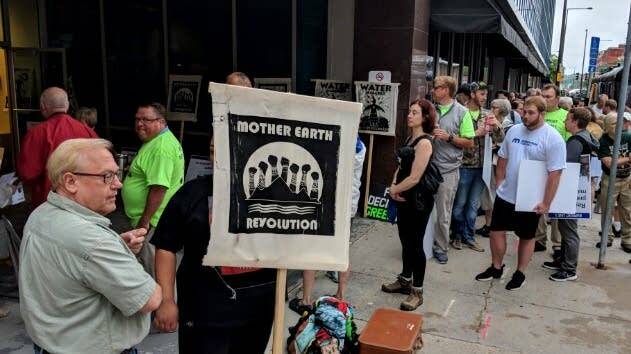 By Monday afternoon, scheduled testimony was over, and the five commission members began asking questions of Enbridge and the other groups involved in the case. Commissioner Dan Lipschultz asked several questions related to disagreement between Enbridge and the project's opponents over what future demand for oil will look like. Enbridge presented information showing that oil shippers want more oil from Alberta's oil sands, but opponents — including the Minnesota Department of Commerce — say that need is related to being able to get crude oil to markets beyond the Midwest, including overseas. The Commission will continue asking questions about the need for the pipeline and the proposed route on Tuesday, with a decision expected no later than June 28.